I started training karate in 1991 and I have over 15 years continuous training and teaching experience in both traditional and sport karate. I started Shito-Ryu karate at the age of 15, in Madrid, Spain, under the tutelage of Miguel Arturo Mengotti and also of Juan Manuel Perez Alcalde, who was the Spanish National Coach when Spain won the World Championship in 1992 in Granada, with world class karateka, Jose Manuel Egea, at the forefront of the National Team. Arturo was more of a traditional karate teacher and placed more focus on the Naha-te techniques as well as Okinawan Kobudo, which I had the chance to train; whilst Juan Manuel focused on Shuri-Te techniques and sports Karate. In 2002 I moved to Oxford, England, and joined the Oxford Karate Academy, run by Shihan Paul Coleman Kyoshi. This was the beginning of my Goju-Ryu Karate training and I have to say that training under Shihan Paul’s tutelage was a real eye opener in both the width and depth of the training and the overall understanding of karate. In 2004 I graded and passed my JKF Goju Kai and Seiwakai black belt 1st Dan; in 2011 graded 2nd Dan Seiwakai, in 2014 I graded to 3rd Dan Seiwakai and in November 2016 I graded to 4th Dan Karate Jutsu Gakkai (KJG), under Shihan Ben Craft. Despite the fact my love for martial arts is and always will be karate, my never-ending curiosity and thirst for knowledge has led me to try new things and have also studied Aikido and Kobudo and in the last 3 years my interests are evolving towards grappling techniques and close range functional technology, thus I’m now researching on Karate-Jutsu, Patrick McCarthy’s work on Koryo Uchinadi and Kenpo Karate. I’d like to think that every martial art brings something to the table and I do have a weak spot for Aikido, very deep in its philosophy, with outstanding grabbing and joint manipulation techniques as well as a strong sense of body awareness. Still, in my humble opinion, Uke and Tori must work together too much in order to make the applications work. Over the years in England I’ve trained under the tutelage of Shihan Ben Craft (6th Dan Seiwakai), Shihan Paul Coleman (7th Dan JKF Goju Kai) and Shihan Leo Lipinski (8th Dan Seiwa Kai, 7th Dan JKF Goju Kai and President Goju Kai Europe). 1991-1995 Trained Shito-Ryu Karate in Madrid, Spain, under Sensei Arturo Mengotti. 1996 -1999 Continued training Shito-Ryu under Mengotti’s Senior student, Rafael Fernandez-Aller. 1999 – 2002 Continued training Shito-Ryu Karate under Sensei, Juan Manauel Perez Alcalde, Spain’s national coach and gold medallist in Granada 1992 World Championship. 2003 – Moved to Oxford, England, and started training Goju-Ryu under Shihan Paul Coleman, at the Oxford Karate Academy. 2004 – Graded to Shodan (1st Dan) in JKF Goju Kai under Shian Paul Coleman & Leo Lipinski in Oxford at the annual JKF Goju Kai Master Seminar held in Oxford. 2004-05 – Briefly trained in Aikido under Sensei Peter Megann at the Oxford Aikikai. 2008 – Briefly trained in Aikido under Spelthorne Aikido Club under Sensei Neil Mould, 4th Dan fukushidoin (instructor) within the UKA. 2009 – Present Returned to Goju-Ryu Karate training under Shihan Paul Coleman, at the Oxford Karate Academy. June 2011 – Attended JKF Goju Kai Seminar in London under Shihan Leo Lipinski and Paul Coleman. Graded to nidan (2nd Dan) in Seiwakai. July 2011 – Joined the Nationals Association of Karate and Martial Arts. August 2011 – Officially establish the Surrey Karate Academy in Chertsey, Surrey. October 2011- Competed in TKF Karate heavy weight kumite reaching semifinals. November 2011 – Returned training Aikido under Sensei Neil Mould. October 2012 – Attended Internatioal JKF Goju Kai and Seiwakai seminar in London. October 2013 – Attended Internatioal JKF Goju Kai and Seiwakai seminar in London. January 2016 – Co-found Karate Jutsu Gakkai KJG) with founder Ben Craft Shihan. May 2016 – Join the European Goju Karate Federation and create the English Goju Karate Federation. May 2016 – Attend Koryu Uchinadi Gasshuku with Hanshi Patrick McCarthy, in Ireland. October 2016 – Attend 2 day seminar with Sensei Taira Masaji in Portsmouth. Mark took up karate relatively late in life a few weeks before turning 40, apart from a few months karate during his teens and a few tai chi classes at around 30. He however has always been active and involved in other sports and had a good fitness level. Soon a passion for karate took hold and after 5 years training within the Go Kan Ryu system obtained his first shodan black belt. As he continued his training and knowledge grew he started to investigate other avenues and developed an interest in the Goju Ryu system as a philosophy and approach that made a real connection. Discovering Surrey Karate Academy by chance and taking a few classes he decided to embrace the style and transfer to training within the Seiwakai family. Within a year of making this move he successfully graded to shodan (1st Dan) in both Seiwakai and JKF Gojukai. 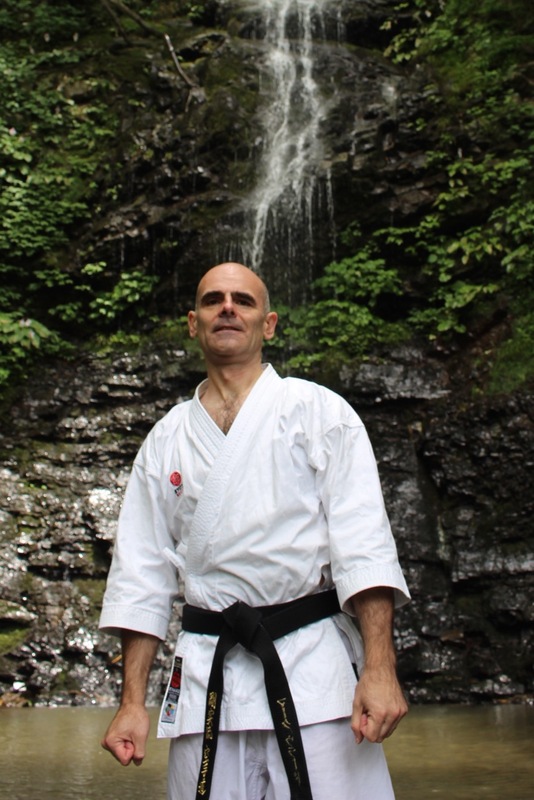 Mark has trained consistently for the past 9 years including attending many seminars with top Goju-Ryu practitioners and a week training in Japan Seiwakai’s Hanshi Seiichi Fujiwara. Mark started teaching with his original club after reaching black belt and now continues to share his passion and knowledge as assistant instructor for Surrey Karate Academy.